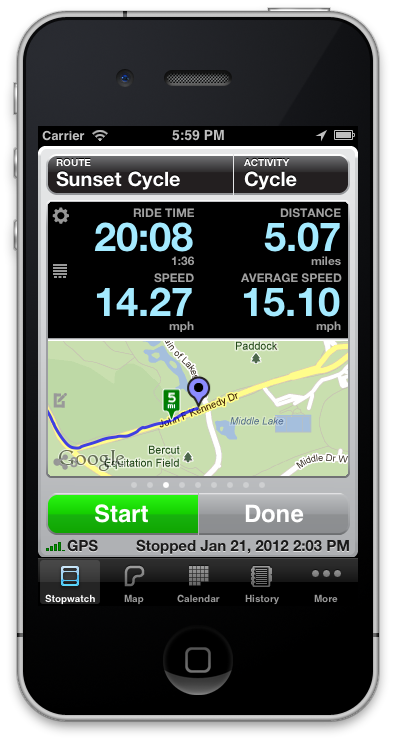 If you’re a running or cycling junkie and you’ve been looking to break down every aspect of your outings to help you analyze and improve them, right on the iPhone, you’re going to like this. We spoke to Abvio, who makes the fantastic Runmeter, Walkmeter and Cyclemeter at Macworld 2012 and they shared some of the features of the new version 7 its workout tracking apps. Runmeter was one of the first couple hundred apps on the App Store and Abvio has been aggressive about adopting new features of iOS like Notification Center. The new versions focus on breaking down and viewing your history in a variety of awesome ways, with charts, graphs, progressive comparisons and more in customizable, swipeable panes. The Runmeter, Cyclemeter and Walkmeter products are all getting the new features as they’re essentially the same application, just targeted to one or another of the activities. You can use any of them for all three activities though. One of the slickest capabilities of the apps is the ability to have it automatically Tweet out when you were beginning a workout and at specified intervals along your route. Any replies that are made to those Tweets by your friends, be it encouragement or envy are read to you by a text-to-speech engine right into your headphones or through the speaker. It’s not a new feature, but still awesome. The new editions of all of the apps should be out later this quarter and will also have a feature-rich stopwatch that measures everything from mileage to your heart rate using a Bluetooth monitor. Abvio’s engineers are data nerds at heart, which means they understand the desire for a quick and powerful way to browse history and statistics of your workout. The new tools looked great in person and they should provide a nice boost in capabilities for the already much-loved suite.